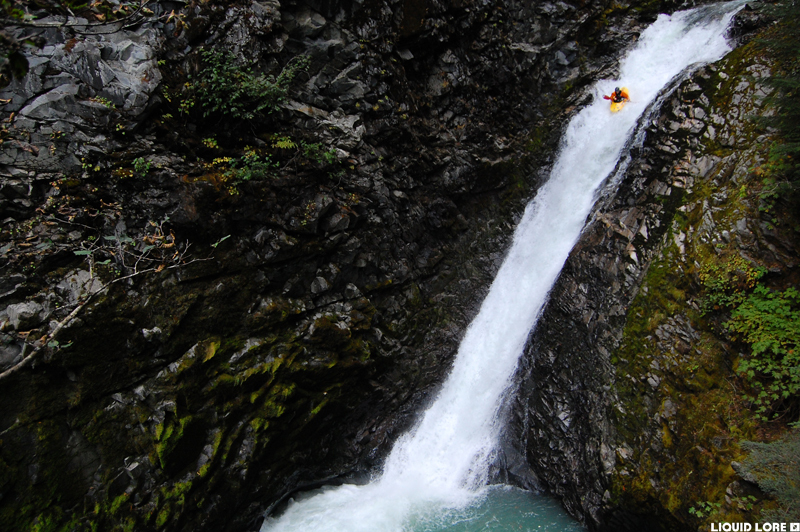 What It's Like: Big waterfalls, mandatory class V, huge commitment. 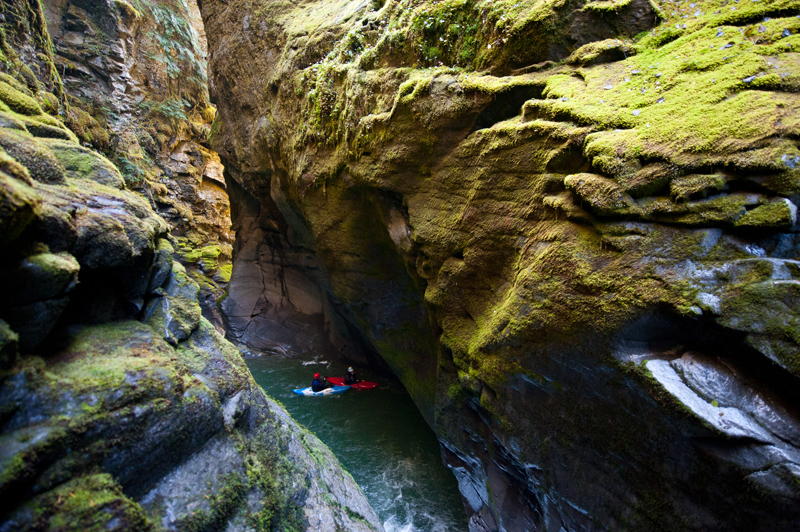 Top tier adventure boating in a fantastic canyon. Scouting/Portaging: Difficult to impossible. Portaging or even walking out for much of the creek is not an option. Level: Online gauge: use the Squamish or the Elaho gauge. Time: At minimum 1 day. Probably multiple days if you want to descend the whole creek without previous knowledge. When To Go: Late fall - usually October. Other Beta: See the story of the first descent at The Range Life here, here, here and here. Map: Click here for a detailed map of the river zone and here for how to get to that zone. Contributed in part by Cody Howard and Steve Arns. There are not many places like Dipper Creek. 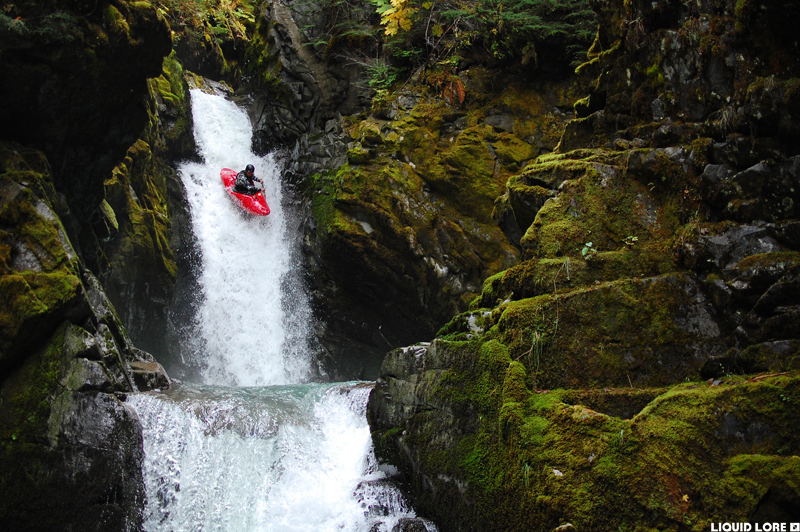 This run, deep in the mountains north of Squamish, has an incredible mixture of everything that you've ever dreamed about that makes up class V kayaking. 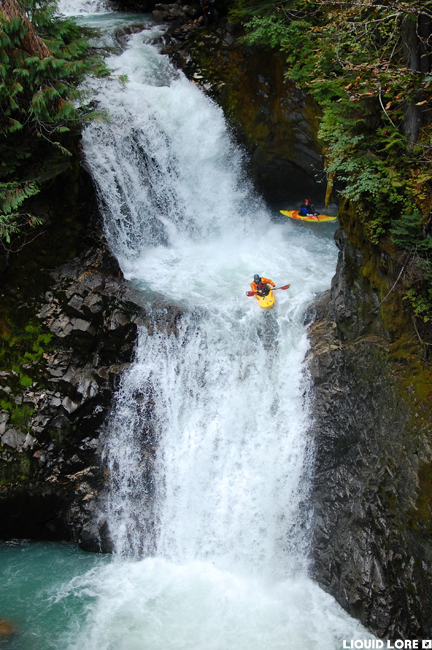 There are big waterfalls and high quality, sometimes mandatory runnable whitewater. It flows through a polished bedrock chasm that really defies description. 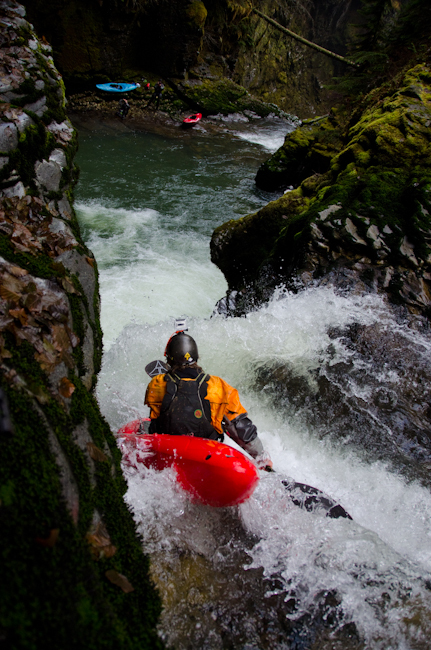 Despite the extremely rugged environment, a short season and a lot of dealing when on the water, this creek truly is the flagship run for high adventure class V creekboating. Dipper Creek is not something to take lightly. 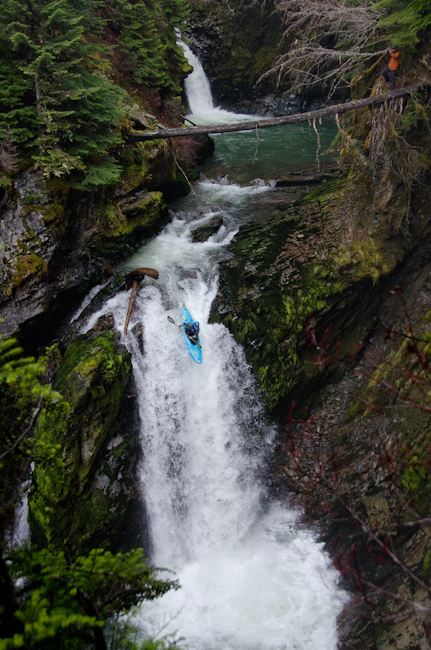 The big waterfalls on this run are not out of the ordinary; it is the incredibly rugged terrain and the inescapability of the Dipper Canyon that raise the stakes of completing the whole run. Were you to get hurt, encounter wood or lose your boat there are many places where you simply cannot portage, walk out or be rescued without a monumental effort. That being said, Dipper is fully runnable (with a few doable portages) from top to bottom - just put in the time to gather recent beta, scout appropriately and maybe have an escape plan and it's all good to go. Access to the Dipper zone is along well maintained active logging roads. The map shows clearly how to get there. When you get to the confluence of the Elaho and Squamish, take the river left road up the Squamish until you can cross the Squamish to river right. Dipper joins the Squamish on the right downstream from this bridge. Continue up the road to reach Dipper's access points. Dipper has multiple access options. The furthest and easiest access is at a bridge over Carnival Creek, a tributary that reaches Dipper after about 1 km. Carnival, and then Dipper to the head of the Canyon is a terrible mank fest. Access to the upper Canyon works by hiking straight down to the river just past the 4 km marker on the logging road. To reach Dipper Camp and the access point to take out for the upper canyons and to put in for Vertigo Gorge take the second left after crossing the bridge over the Squamish. Follow the road to a large clear cut. The canyon here is steep but not cliffed out - you can go up and down from the river out the back of the clear cut, directly across from a landslide on the far side of the river. There is an animal trail that follows the rim of the canyon all the way to the Squamish that is found on the downstream end of the clear cut, allowing easy scouting of Vertigo Gorge. You can take out at any of the access points, or you can thrash your way out anywhere if you can find a way to climb out of the canyon. If you complete the run you can hike back up the animal trail to Dipper Camp, or you can continue for about 1 km down the Squamish through an amazing canyon where there is a short but steep hike up to the road. The best hike out option is marked with flagging tape (2011) and is found after you leave the canyon just below the Dipper/Squamish confluence behind. Anything but low water for Dipper will be too high. Late September through early November is the best betting time as it is usually snowed in while flows are low enough in the spring. Look for cool, clear weather in the days leading up to an attempt at Dipper. Keeping in mind the Squamish gauge is far downstream, under 80 cms seems to be acceptable. The Elaho is probably the best gauge to use, and it probably needs to be under 40 cms. These are rough guesses - small level changes will make a noticeable difference on this run, so get a visual of some of the critical points if you can. 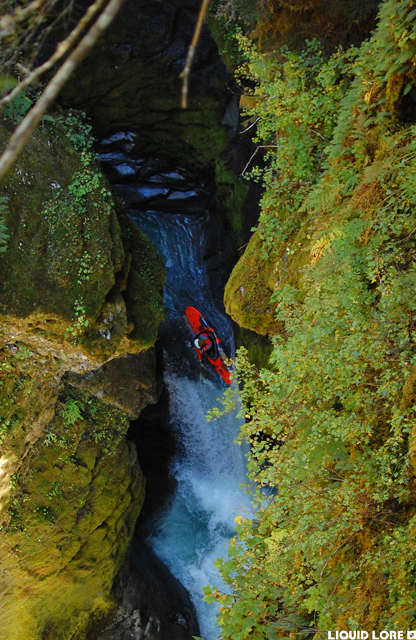 The upper canyons are best with a bit more water, the trade off being Vertigo will be spicy or too high. You can hike in to the run the waterfalls below Vertigo Gorge at summer flows, but everything else is much too high to attempt. If you decide to start at the Carnival Creek bridge expect a lot of mank. This access is not recommended. The rapid of note on Carnival is a sweet 25 footer. You'll do some portaging and smash a fair bit of mank even once you reach Dipper, which continues all the way to the head of Dipper Canyon. Things start abruptly at the head of the canyon with the Double Dip/Big Dipper combo. The first is a two staged 40 footer and the second a 60 foot steep and narrow slide followed by a good 10 foot boof. They can be walked. If you continue below here you're generally locked in until the half way access point above Vertigo Gorge. The canyon between the big entrance falls and the access point below Dipper Camp is a complex river puzzle, complicated by the deep inaccessible canyon that isn't easy to scout prior to dropping in. This is the least friendly section of the run, and if you drop in be aware there are many mandatory rapids and a few mandatory portages. As of the 2014 season it was navigable, but this can change depending on the state of wood and the rapids, several which have changed over the years. It's impossible to describe this section in detail. You will encounter some good slides and many narrow rapids with names that play off the name of the Creek (Skinny Dip etc). The first major crux is Rowdy Flatwater, a long twisting slide with sticky holes and tough portage options. Below Rowdy Flatwater are more good rapids, and then a major narrowing into the middle gorge. Some of the rapids in this section have been changing and should they go from runnable to unrunnable it will render the whole section not good to go. Expect a sketcky portage in this section. This opens up to gnarly mank that leads to Vertigo Gorge. Hike up and out to reach Dipper Camp. 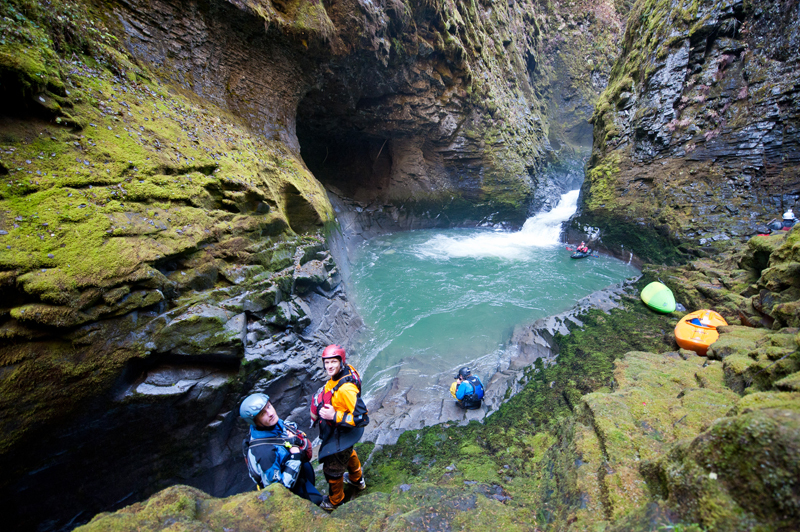 Vertigo Gorge is the heart of Dipper Creek. The easiest section of Dipper to run is from Dipper Camp through Vertigo Gorge and the upper Squamish. The crux of Vertigo is the 25-30 foot entrance waterfall. There is steep access in and out of the canyon at the lip of the falls. While there is a bad pocket in the landing zone, only the first person is without good safety as there is a decent eddy at the bottom where you can stop and get out of your boat. Vertigo continues through an intimidating series of bedrock ledges. After the gorge you'll run some boogie and then reach a slide to 40 called Rock Snot that appears to land on rock but has been run. Two more waterfalls, including the iconic Squamish confluence falls brings you to the end of the river, and the pleasant paddle out through the Upper Squamish. Have fun on Dipper, it is a monster and a classic - perhaps one of the greatest adventure creekboating runs ever. 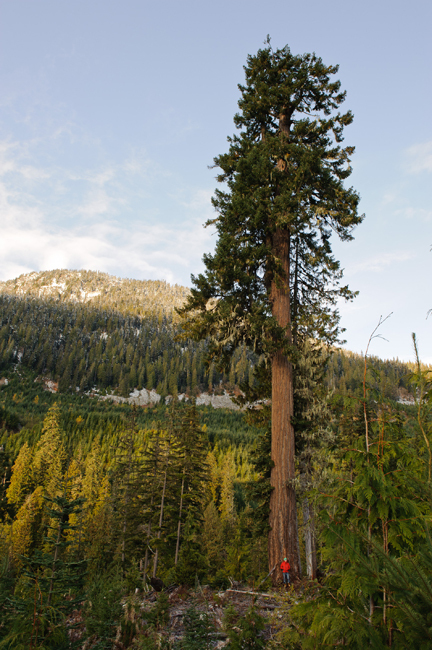 The massive Douglas Fir that stands watch over Dipper Camp. Maxi Kniewasser photo. The only good drop on Carnival Creek above the Dipper confluence. 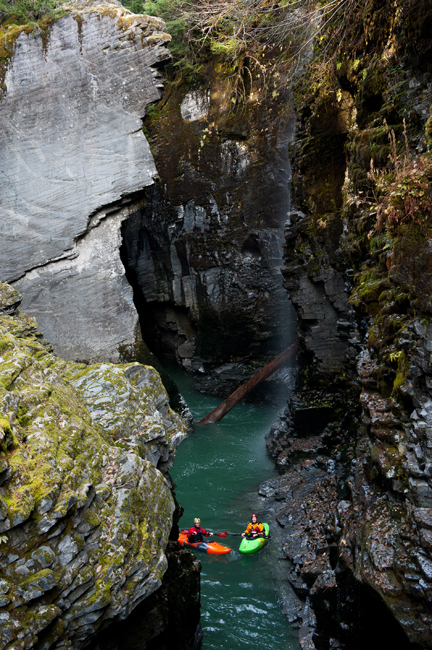 Double Dip - the entrance to Dipper Canyon. The recommended access for the upper canyon should bring you to the river right at this spot. Big Dipper, the biggest drop on the whole run. 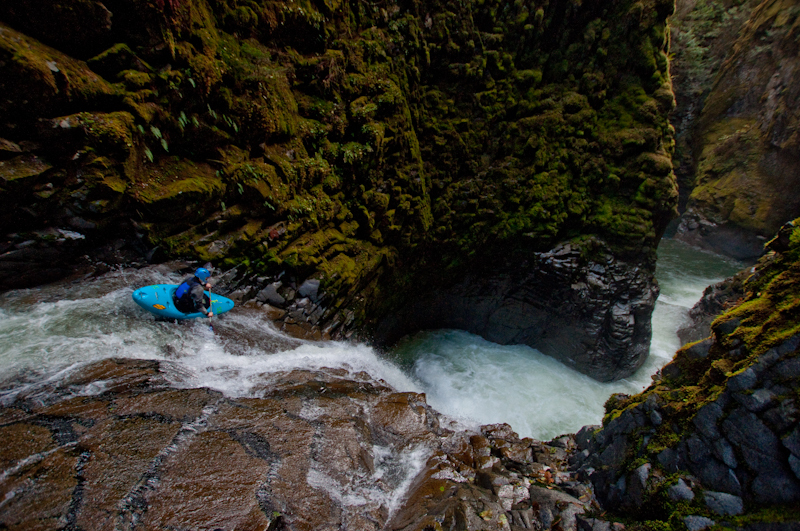 Ben Hawthorne on the first descent of this rapid. The entrance waterfall to Vertigo Gorge. This is a stout spot, particularly at higher flows. In the heart of Vertigo Gorge. Ric Moxon and Rob Murphy enjoying the scene. Maxi Kniewasser photo. 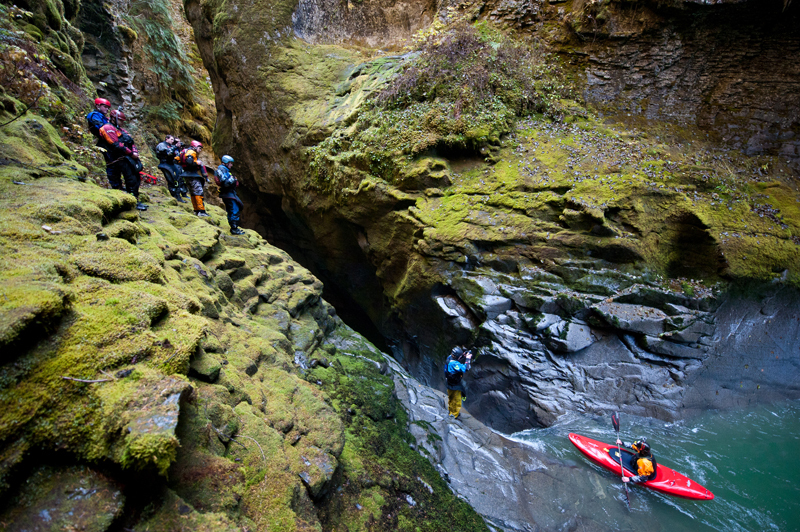 An intimidating crack in Vertigo Gorge. Maxi Kniewasser photo. An amazing place. Maxi Kniewasser photo. Peering down into Vertigo Gorge. Exiting Vertigo, into the light. Maxi Kniewasser photo. The 20 footer just above the confluence waterfall. Sandy Macewan photo. The confluence waterfalls where Dipper enters the Squamish River. A fitting end. Sandy Macewan photo. 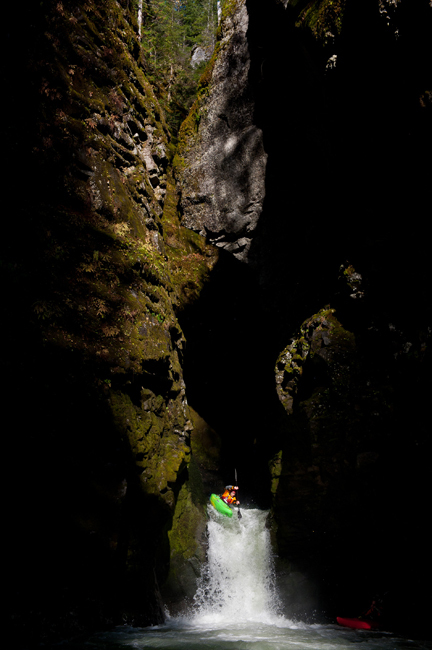 The amazing scenery on the paddle out through the Upper Squamish gorges. Maxi Kniewasser photo.